How to change the disk usage and traffic limit of a subscription? Note: If you are a domain owner and need your disk space to be expanded, contact your service provider for assistance. 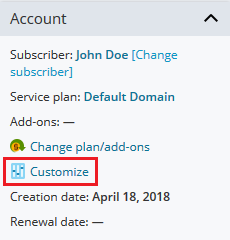 In Plesk, go to Subscriptions > example.com > Customize. On the Customizing Subscription page, set up the value for Disk space or Traffic, then click Update & Lock. Note: In case of changing subscription's limit, the subscription will be locked from syncing with its service plan. In Plesk, go to Service Plans > select service plan > Resources tab. Set up the value for Disk space, then click Update & Sync.